In 1950, as thousands of workers descended on Fawley to build a new refinery, a much smaller construction team set about building a model of the same thing. 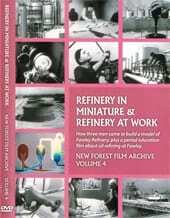 This film documents the making of the 1:384 scale miniature refinery which took 3 men over a year to complete. It was then exhibited at Southampton’s Festival of Britain Show in 1951 before being installed in the refinery Administration Building.